Many naturally occurring agents directly bind with and activate PPAR gamma. These agents include various polyunsaturated fatty acids like arachidonic acid and arachidonic acid metabolites such as certain members of the 5-Hydroxyicosatetraenoic acid and 5-oxo-eicosatetraenoic acid family, e.g. 5-oxo-15(S)-HETE and 5-oxo-ETE or 15-Hydroxyicosatetraenoic acid family including 15(S)-HETE, 15(R)-HETE, and 15(S)-HpETE. The activation of PPAR gamma by these and other ligands may be responsible for inhibiting the growth of cultured human breast, gastric, lung, prostate and other cancer cell lines. Many insulin sensitizing drugs (namely, the thiazolidinediones) used in the treatment of diabetes target PPARG as a means to lower serum glucose without increasing pancreatic insulin secretion. Different classes of compounds which activate PPARgamma weaker than thiazolidinediones (the so-called “partial agonists of PPARgamma”) are currently studied with the hope that such compounds would be still effective hypoglycaemic agents but with fewer side effects. ↑ "Diseases that are genetically associated with PPARG view/edit references on wikidata". ↑ "Drugs that physically interact with Peroxisome proliferator-activated receptor gamma view/edit references on wikidata". ↑ Greene ME, Blumberg B, McBride OW, Yi HF, Kronquist K, Kwan K, Hsieh L, Greene G, Nimer SD (1995). "Isolation of the human peroxisome proliferator activated receptor gamma cDNA: expression in hematopoietic cells and chromosomal mapping". Gene Expr. 4 (4–5): 281–99. PMID 7787419. ↑ Elbrecht A, Chen Y, Cullinan CA, Hayes N, Leibowitz MD, Moller DE, Berger J (July 1996). "Molecular cloning, expression and characterization of human peroxisome proliferator activated receptors gamma 1 and gamma 2". Biochem. Biophys. Res. Commun. 224 (2): 431–7. doi:10.1006/bbrc.1996.1044. PMID 8702406. ↑ Michalik L, Auwerx J, Berger JP, Chatterjee VK, Glass CK, Gonzalez FJ, Grimaldi PA, Kadowaki T, Lazar MA, O'Rahilly S, Palmer CN, Plutzky J, Reddy JK, Spiegelman BM, Staels B, Wahli W (December 2006). "International Union of Pharmacology. LXI. Peroxisome proliferator-activated receptors". Pharmacol. Rev. 58 (4): 726–41. doi:10.1124/pr.58.4.5. PMID 17132851. ↑ Fajas L, Auboeuf D, Raspé E, Schoonjans K, Lefebvre AM, Saladin R, Najib J, Laville M, Fruchart JC, Deeb S, Vidal-Puig A, Flier J, Briggs MR, Staels B, Vidal H, Auwerx J (July 1997). "The organization, promoter analysis, and expression of the human PPARgamma gene". J. Biol. Chem. 272 (30): 18779–89. doi:10.1074/jbc.272.30.18779. PMID 9228052. ↑ Jones JR, Barrick C, Kim KA, Lindner J, Blondeau B, Fujimoto Y, Shiota M, Kesterson RA, Kahn BB, Magnuson MA (April 2005). "Deletion of PPARγ in adipose tissues of mice protects against high fat diet-induced obesity and insulin resistance". Proc. Natl. Acad. Sci. U.S.A. 102 (17): 6207–12. Bibcode:2005PNAS..102.6207J. doi:10.1073/pnas.0306743102. PMC 556131 . PMID 15833818. ↑ "Entrez Gene: PPARG peroxisome proliferator-activated receptor gamma". ↑ Dreyer C, Keller H, Mahfoudi A, Laudet V, Krey G, Wahli W (1993). "Positive regulation of the peroxisomal beta-oxidation pathway by fatty acids through activation of peroxisome proliferator-activated receptors (PPAR)". Biol. Cell. 77 (1): 67–76. doi:10.1016/s0248-4900(05)80176-5. PMID 8390886. ↑ O'Flaherty JT, Rogers LC, Paumi CM, Hantgan RR, Thomas LR, Clay CE, High K, Chen YQ, Willingham MC, Smitherman PK, Kute TE, Rao A, Cramer SD, Morrow CS (2005). "5-Oxo-ETE analogs and the proliferation of cancer cells". Biochim. Biophys. Acta. 1736 (3): 228–36. doi:10.1016/j.bbalip.2005.08.009. PMID 16154383. ↑ Naruhn S, Meissner W, Adhikary T, Kaddatz K, Klein T, Watzer B, Müller-Brüsselbach S, Müller R (2010). "15-hydroxyeicosatetraenoic acid is a preferential peroxisome proliferator-activated receptor beta/delta agonist". Mol. Pharmacol. 77 (2): 171–84. doi:10.1124/mol.109.060541. PMID 19903832. ↑ Krishnan A, Nair SA, Pillai MR (2007). "Biology of PPAR gamma in cancer: a critical review on existing lacunae". Curr. Mol. Med. 7 (6): 532–40. doi:10.2174/156652407781695765. PMID 17896990. ↑ Berger J, Patel HV, Woods J, Hayes NS, Parent SA, Clemas J, Leibowitz MD, Elbrecht A, Rachubinski RA, Capone JP, Moller DE (April 2000). "A PPARgamma mutant serves as a dominant negative inhibitor of PPAR signaling and is localized in the nucleus". Mol. Cell. Endocrinol. 162 (1–2): 57–67. doi:10.1016/S0303-7207(00)00211-2. PMID 10854698. ↑ Gampe RT, Montana VG, Lambert MH, Miller AB, Bledsoe RK, Milburn MV, Kliewer SA, Willson TM, Xu HE (March 2000). "Asymmetry in the PPARgamma/RXRalpha crystal structure reveals the molecular basis of heterodimerization among nuclear receptors". Mol. Cell. 5 (3): 545–55. doi:10.1016/S1097-2765(00)80448-7. PMID 10882139. 1 2 3 Fajas L, Egler V, Reiter R, Hansen J, Kristiansen K, Debril MB, Miard S, Auwerx J (December 2002). "The retinoblastoma-histone deacetylase 3 complex inhibits PPARgamma and adipocyte differentiation". Dev. Cell. 3 (6): 903–10. doi:10.1016/S1534-5807(02)00360-X. PMID 12479814. 1 2 3 4 Kodera Y, Takeyama K, Murayama A, Suzawa M, Masuhiro Y, Kato S (October 2000). "Ligand type-specific interactions of peroxisome proliferator-activated receptor gamma with transcriptional coactivators". J. Biol. Chem. 275 (43): 33201–4. doi:10.1074/jbc.C000517200. PMID 10944516. ↑ Franco PJ, Li G, Wei LN (August 2003). 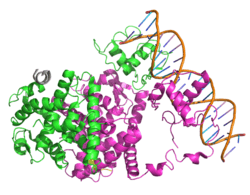 "Interaction of nuclear receptor zinc finger DNA binding domains with histone deacetylase". Mol. Cell. Endocrinol. 206 (1–2): 1–12. doi:10.1016/S0303-7207(03)00254-5. PMID 12943985. ↑ Heinlein CA, Ting HJ, Yeh S, Chang C (June 1999). "Identification of ARA70 as a ligand-enhanced coactivator for the peroxisome proliferator-activated receptor gamma". J. Biol. Chem. 274 (23): 16147–52. doi:10.1074/jbc.274.23.16147. PMID 10347167. ↑ Nishizawa H, Yamagata K, Shimomura I, Takahashi M, Kuriyama H, Kishida K, Hotta K, Nagaretani H, Maeda N, Matsuda M, Kihara S, Nakamura T, Nishigori H, Tomura H, Moore DD, Takeda J, Funahashi T, Matsuzawa Y (January 2002). "Small heterodimer partner, an orphan nuclear receptor, augments peroxisome proliferator-activated receptor gamma transactivation". J. Biol. Chem. 277 (2): 1586–92. doi:10.1074/jbc.M104301200. PMID 11696534. ↑ Wallberg AE, Yamamura S, Malik S, Spiegelman BM, Roeder RG (November 2003). "Coordination of p300-mediated chromatin remodeling and TRAP/mediator function through coactivator PGC-1alpha". Mol. Cell. 12 (5): 1137–49. doi:10.1016/S1097-2765(03)00391-5. PMID 14636573. ↑ Puigserver P, Adelmant G, Wu Z, Fan M, Xu J, O'Malley B, Spiegelman BM (November 1999). "Activation of PPARgamma coactivator-1 through transcription factor docking". Science. 286 (5443): 1368–71. doi:10.1126/science.286.5443.1368. PMID 10558993. ↑ Li Y, Qi Y, Huang TH, Yamahara J, Roufogalis BD (January 2008). "Pomegranate flower: a unique traditional antidiabetic medicine with dual PPAR-alpha/-gamma activator properties". Diabetes Obes Metab. 10 (1): 10–7. doi:10.1111/j.1463-1326.2007.00708.x. PMID 18095947. ↑ Hamblin M, Chang L, Fan Y, Zhang J, Chen YE (June 2009). "PPARs and the Cardiovascular System". Antioxid. Redox Signal. 11 (6): 1415–52. doi:10.1089/ARS.2008.2280. PMC 2737093 . PMID 19061437. ↑ Khateeb J, Gantman A, Kreitenberg AJ, Aviram M, Fuhrman B (January 2010). "Paraoxonase 1 (PON1) expression in hepatocytes is upregulated by pomegranate polyphenols: a role for PPAR-gamma pathway". Atherosclerosis. 208 (1): 119–25. doi:10.1016/j.atherosclerosis.2009.08.051. PMID 19783251. ↑ Atanasov AG, Wang JN, Gu SP, Bu J, Kramer MP, Baumgartner L, Fakhrudin N, Ladurner A, Malainer C, Vuorinen A, Noha SM, Schwaiger S, Rollinger JM, Schuster D, Stuppner H, Dirsch VM, Heiss EH (2013). "Honokiol: a non-adipogenic PPARγ agonist from nature". Biochim. Biophys. Acta. 1830 (10): 4813–9. doi:10.1016/j.bbagen.2013.06.021. PMC 3790966 . PMID 23811337. ↑ Atanasov AG, Blunder M, Fakhrudin N, Liu X, Noha SM, Malainer C, Kramer MP, Cocic A, Kunert O, Schinkovitz A, Heiss EH, Schuster D, Dirsch VM, Bauer R (2013). "Polyacetylenes from Notopterygium incisum--new selective partial agonists of peroxisome proliferator-activated receptor-gamma". PLoS ONE. 8 (4): e61755. Bibcode:2013PLoSO...861755A. doi:10.1371/journal.pone.0061755. PMC 3632601 . PMID 23630612. ↑ Kroll TG, Sarraf P, Pecciarini L, Chen CJ, Mueller E, Spiegelman BM, Fletcher JA (August 2000). "PAX8-PPARgamma1 fusion oncogene in human thyroid carcinoma [corrected]". Science. 289 (5483): 1357–60. Bibcode:2000Sci...289.1357K. doi:10.1126/science.289.5483.1357. PMID 10958784. ↑ Mitchell RS, Kumar V, Abbas AK, Fausto N (2007). "20". Robbins Basic Pathology (8th ed.). Philadelphia: Saunders/Elsevier. ISBN 1-4160-2973-7. Qi C, Zhu Y, Reddy JK (2001). "Peroxisome proliferator-activated receptors, coactivators, and downstream targets". Cell Biochem. Biophys. 32 Spring: 187–204. PMID 11330046. Kadowaki T, Hara K, Kubota N, Tobe K, Terauchi Y, Yamauchi T, Eto K, Kadowaki H, Noda M, Hagura R, Akanuma Y (2002). "The role of PPARgamma in high-fat diet-induced obesity and insulin resistance". J. Diabetes Complicat. 16 (1): 41–5. doi:10.1016/S1056-8727(01)00206-9. PMID 11872365. Wakino S, Law RE, Hsueh WA (2002). "Vascular protective effects by activation of nuclear receptor PPARgamma". J. Diabetes Complicat. 16 (1): 46–9. doi:10.1016/S1056-8727(01)00197-0. PMID 11872366. Takano H, Komuro I (2002). "Roles of peroxisome proliferator-activated receptor gamma in cardiovascular disease". J. Diabetes Complicat. 16 (1): 108–14. doi:10.1016/S1056-8727(01)00203-3. PMID 11872377. Stumvoll M, Häring H (2002). "The peroxisome proliferator-activated receptor-gamma2 Pro12Ala polymorphism". Diabetes. 51 (8): 2341–7. doi:10.2337/diabetes.51.8.2341. PMID 12145143. Koeffler HP (2003). "Peroxisome proliferator-activated receptor gamma and cancers". Clin. Cancer Res. 9 (1): 1–9. PMID 12538445. Puigserver P, Spiegelman BM (2003). "Peroxisome proliferator-activated receptor-gamma coactivator 1 alpha (PGC-1 alpha): transcriptional coactivator and metabolic regulator". Endocr. Rev. 24 (1): 78–90. doi:10.1210/er.2002-0012. PMID 12588810. Takano H, Hasegawa H, Nagai T, Komuro I (2003). "The role of PPARgamma-dependent pathway in the development of cardiac hypertrophy". Drugs Today. 39 (5): 347–57. doi:10.1358/dot.2003.39.5.799458. PMID 12861348. Rangwala SM, Lazar MA (2004). "Peroxisome proliferator-activated receptor gamma in diabetes and metabolism". Trends Pharmacol. Sci. 25 (6): 331–6. doi:10.1016/j.tips.2004.03.012. PMID 15165749. Cuzzocrea S (2005). "Peroxisome proliferator-activated receptors gamma ligands and ischemia and reperfusion injury". Vascul. Pharmacol. 41 (6): 187–95. doi:10.1016/j.vph.2004.10.004. PMID 15653094. Savage DB (2007). "PPAR gamma as a metabolic regulator: insights from genomics and pharmacology". Expert Reviews in Molecular Medicine. 7 (1): 1–16. doi:10.1017/S1462399405008793. PMID 15673477. Pégorier JP (2005). "[PPAR receptors and insulin sensitivity: new agonists in development]". Ann. Endocrinol. (Paris). 66 (2 Pt 2): 1S10–7. PMID 15959400. Tsai YS, Maeda N (2005). "PPARgamma: a critical determinant of body fat distribution in humans and mice". Trends Cardiovasc. Med. 15 (3): 81–5. doi:10.1016/j.tcm.2005.04.002. PMID 16039966. Gurnell M (2006). "Peroxisome proliferator-activated receptor gamma and the regulation of adipocyte function: lessons from human genetic studies". Best Pract. Res. Clin. Endocrinol. Metab. 19 (4): 501–23. doi:10.1016/j.beem.2005.10.001. PMID 16311214. Cecil JE, Watt P, Palmer CN, Hetherington M (2006). "Energy balance and food intake: the role of PPARgamma gene polymorphisms". Physiol. Behav. 88 (3): 227–33. doi:10.1016/j.physbeh.2006.05.028. PMID 16777151. Rousseaux C, Desreumaux P (2007). "[The peroxisome-proliferator-activated gamma receptor and chronic inflammatory bowel disease (PPARgamma and IBD)]". J. Soc. Biol. 200 (2): 121–31. doi:10.1051/jbio:2006015. PMID 17151549. Eriksson JG (2007). "Gene polymorphisms, size at birth, and the development of hypertension and type 2 diabetes". J. Nutr. 137 (4): 1063–5. PMID 17374678. Tönjes A, Stumvoll M (2007). "The role of the Pro12Ala polymorphism in peroxisome proliferator-activated receptor gamma in diabetes risk". Current opinion in clinical nutrition and metabolic care. 10 (4): 410–4. doi:10.1097/MCO.0b013e3281e389d9. PMID 17563457. Burgermeister E, Seger R (2007). "MAPK kinases as nucleo-cytoplasmic shuttles for PPARgamma". Cell Cycle. 6 (13): 1539–48. doi:10.4161/cc.6.13.4453. PMID 17611413. Papageorgiou E, Pitulis N, Msaouel P, Lembessis P, Koutsilieris M (2007). "The non-genomic crosstalk between PPAR-gamma ligands and ERK1/2 in cancer cell lines". Expert Opin. Ther. Targets. 11 (8): 1071–85. doi:10.1517/14728222.11.8.1071. PMID 17665979.